As one of the new cool features in MGS 5: The Phantom Pain is the Venom Snake's bionic arm. You can continue to evolve the multi-functional prosthetic arm throughout the game and use it both to elucidation, anesthesia and as a killing tool. We explain you here all the functions and upgrades of the bionic arm. After the explosion of the Mother Base in MGS 5: Ground Zeroes Big Boss not only lost nine years of his life because of his comatose state, but also his left arm. However, this loss is compensated by a prosthetic arm again, which brings all sorts of useful skills. What features and upgrades, the bionic arm has on it, we show you here. After Snake has overcome at the beginning of the shock of his lost arm, you get quite early in the game the bionic arm, which revealed diverse functions in the game. For example, you can simulate the denture knocking sounds to lure opponents. This works even when lying down. By default, the bionic arm comes in red version. But you can also develop a gold finish or you get it when you transmit your Score from MGS 5: Ground Zeroes. 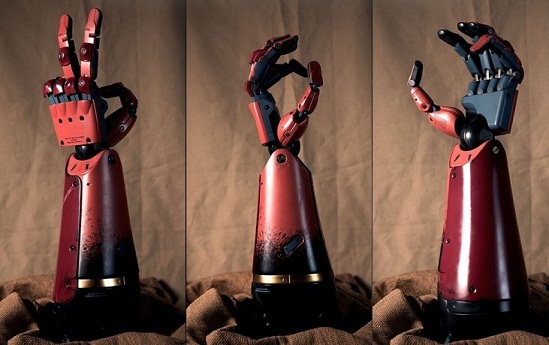 Do you want to have a real bionic arm for home, it also exists as an extra in the Collectors Edition of MGS 5: The Phantom Pain. The bionic arm can be used both to alert and to stun and eliminate enemies. With appropriate level ascents of your units on the Mother Base also you are allowed always exploring new features and making ready for use. In the following chart you can see all the upgrades including requirements and costs. - Alternatively, as a reward by Score transmission.